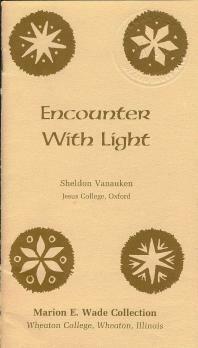 Encounter With Light was a booklet written by Sheldon Vanauken around 1960 dealing with his conversion. At one time copies of this booklet were available from The Marion E. Wade Center, Wheaton College, Wheaton, Illinois and from Church of the Covenant, Lynchburg, Virginia. Van drew on material in this booklet when writing chapters IV and V of A Severe Mercy. Encounter With Light and the three C. S. Lewis letters it contains are in the public domain. Here is the text. . . . This is an account of a spiritual journey, told of necessity from the changing points of view of the traveller. There may have been an invisible Someone (God the Spirit) to help and an invisible Enemy to hinder, but their action was not suspected at the time. And yet, they may have been the real protagonists and my role the modest one of that which is fought for, the guerdon or the maiden in the tower. But not that only; for, however greatly I may have been helped, in the end I had to choose--and abide the consequences. By doubting, then, and by abandoning a seemingly inadequate Christianity that I had never, so to speak, believed on my own, I had taken the first step towards real belief. Perhaps any belief that one has not thought one's own way to is inadequate. But, in addition, there were four specific inadequacies in the only Christianity I knew: it was not exciting, not positive, not big enough, and not related to life. It was not exciting: The Greeks in history, with their passion for truth and beauty, lucid as a sunlit Doric temple above the wine-dark sea, were exciting; astronomy, with its blazing stars and icy distances, was exciting; poetry, reaching for beauty in words of splendour, was exciting; but this Christianity, with its fragmented accounts of dark and incomprehensible deeds in Palestine and its solemn, humourless voices, was too stuffy for excitement, too dull for tears. It was not positive: the Christians dying in the Roman arena had died for something; the crusader knights riding under the cross of gold had fought for something; but this Christianity did not preach the crusade--the cross led only to respectability. Indeed, the message seemed to be, mainly, that one was bad if one did any of quite a long list of things, such as saying 'Damn!' or missing church or drinking any of the joyous, sunny wine that Our Lord had made at Cana--indeed, the churches 'improved' on the innocent Jesus by rejecting the glowing wine that was His chosen symbol of the Eucharist in favour of solemn tinned grape juice. It was all negative and on the whole repressive; one was not working for something, except perhaps new chairs for the Sunday School and, of course, a rather dull Heaven--though the occasions when someone presumably attained Heaven were ones of unmitigated gloom. It was not big enough: This Christianity was simply not big enough to include all the worlds that swung about our sun and all the worlds that might swing about a million racing suns in the chilling immensities of space; how could the redemption of Earth, in so far as it was redeemed, be related to Aldebaran or the spiral nebulae? This Christianity, then, was too little to be the truth. Finally, it was not related to life: Outside the church doors beat the turbulence and crookedness and splendour of life. What had the churches got to say about it? With respect to war and arms, the voice of this Christianity was a feeble mutter. It was against sin, to be sure; but the businessmen who practised a dog-eat-dog ethic six days a week were well received at the altar rail--and at the collection plate. Nor was anyone ever rebuked for coming to the altar when she was well known not to be on speaking terms with someone else in the church. Nor was anyone ever turned away for pride. On the other hand, to be fair, it was clear that one oughtn't to say 'Damn!' And there were some people who would not be welcomed at the altar rail: the dark-skinned. Who could believe that here in this stuffiness, with all the beauty and laughter and pain of life held at bay outside the church--who could believe that here were the truths of life and death? I could not, and I doubted whether anyone else did. I turned away from this religion and declared for atheism. Such a relief! What freedom! And atheism was exhilarating: if the gods were dead, then man was the highest. Glorious! And it was a belief totally opposed to that impossible Christianity--a strong, bold creed. But what had I said? A belief? A creed? There was the flaw in atheism: one must believe in no-god. It, too, is a faith. There is no evidence and, certainly, no revelation; and by the nature of the case there can be none. So--I renounced atheism. The next step was agnosticism: not knowing, and sceptical about the possibility of knowing. And yet, at almost the same time, I began to think that perhaps one could know a little. Geometry with its unprovable but self-evident axioms provided a clue. Were there any axioms having to do with the meaning of things? I decided that something had created the universe. This was self-evident, axiomatic. Then I applied myself to the consideration of whether there were any self-evident indications of the nature of this 'first cause,' and I perceived order. These were, of course, well-worn ways I was treading, but they were new to me. It began to seem axiomatic that the power that made the universe was intelligent and infinite: order must be a function of intelligence; and only infinite intelligence could comprehend the infinities of space and time. A very great awareness of beauty coupled with the recognition that everything was beautiful, except where marred by man, persuaded me that beauty was a reflection of the beauty of the Power. (It was much later that I read Plato with excited recognition.) For a long time I wondered whether good might not be, like beauty, an axiomatic attribute of the Power. But good did not exist in nature; it existed in man and was countered by evil, and I could not attribute it, self-evidently, to the Power, which remained impersonal. I did not believe in prayer, providence, or judgement. And my ethics were unrelated to my god. I had thus reached, while still in boarding school, a kind of cold theism, which I was to hold for many years. Once, in my first year of college, I wavered, needing help that could come only through the miraculous intervention of a personal god; I offered up a few urgent and desperate prayers. When, as expected, no great Hand reached down, I was confirmed in my non-Christian theism. In subsequent years I was dedicated, almost religiously, to beauty and to the love of one person; and, having youth and good fortune, I was happy, mainly through that love. In general I attempted goodness, feeling it to be, like love and beauty, part of the Tao, or Way. It was, in fact, a fairly high sort of paganism, and the inadequacies of such a position are much less obvious than those of materialism. Meanwhile, Christianity, which I made no pretense of having the slightest connection with, continued to appear to me as a delusive religion that made quite incredible claims about a brave and fanatical Jew--a religion to be outgrown like one's childish belief in elves and fairies. While there was a sort of beauty in the Christian story (as there was in fairy lore), it did not extend to the churches: they seemed narrow, smug, and complacent, quarrelling obscurely about alleged truths they couldn't agree on; they spoke in clich�s with a fruity unctuousness that was incredibly revolting about 'mountaintop experiences' and 'fruitful fellowship'; they sang sticky and horrible hymns and built a good many horrible buildings. I not only disbelieved in Christianity, I disliked it heartily; and a person dropped like a stone in my estimation if he confessed to being a Christian. But I could quite easily keep my distance, and I did so. One wakeful night, standing upon the bridge of a ship in tropical waters, a shimmering moonpath reaching from my toes to the horizon, I fell to thinking a most dangerous series of thoughts: It's odd (the thoughts ran) that otherwise intelligent people like T. S. Eliot, the brilliant poet, and Eddington, the famous physicist, and Dorothy Sayers, the novelist and essayist, with her caustic wit and keen intelligence--it's very odd that they apparently actually believe in this Christianity that I saw through in my teens. Could there possibly be more to it than I saw? No, certainly not! Still, it is odd. I wonder how they can believe it. There must be something. Could it be, perhaps, that I, possibly, ought to have another look, sometime? Not that it's true, of course--quite impossible!--still, one is supposed to be intellectually honest and hear what the other side has to say. Obviously it's not true, but, Good Heavens! it wouldn't hurt me to look at it. Yes, I'll do that, sometime. Next day, while I didn't renounce the resolve, I thought with a touch of regret that it all looked like rather a lot of dreary work, and for what? Just to be intellectually honest. Whatever had put such an idea into my head? Naturally, Christianity wasn't true: it was precisely incredible and almost all Christians were horrible. At all events, the second look was not then possible, nor for a long time to come. Still, as months and years went by, I never quite forgot the resolve; possibly Someone at my elbow saw to it that I did not forget. But I was occupied with 'important' things, studying history at the Yale graduate school and doing a little teaching. I became concerned about the tendency in so many parts of the world to erect the state, or the state-disguised-as-the-people, or the community, or the organization, into a soulless monster more important than the individuals that comprised it. I recognized that the Christian Church strongly asserted the importance of the individual, and I became conscious of a faint sense of alliance. At the same time my interest in history and language prompted me occasionally to attend the Anglican Church, of which nominally I was a member, just to hear the lovely and ancient words of the liturgy: it is possible that, in spite of myself, some of the meanings sank home. Once I actually took the sacrament (I can't think why)--and if, as the Apostolic churches believe, the Eucharist is a means to grace, my action may have had an incalculable effect. But, certainly, I was not a believer--not a Christian. The next influence was that of a place: England and Oxford. At this ancient University, mellowed by the strong intellectual life of a thousand years, many things that seem anachronisms in the hustle of American academic life--cap and gown, gothic spires, Latin inscriptions, and Greek ideas--seem almost of the essence. In this city of the dreaming spires the University, despite the modern laboratories, is still, in fact, 'breathing the last enchantments of the middle ages': This wall was part of a great abbey; the Benedictines built the long, lovely buildings that are part of one college quad; the narrow passage where one bought tea things has been called Friars Entry for centuries; the Colleges bear names like Christ Church and Mary Magdalen and St. Anne and Corpus Christi--and from them and from half a hundred churches the singing bells sent their lovely clamour across the city. All of a sudden, the ages of faith, when men really believed, when the spires carried their eyes up to God, became real. The great bells still spoke with their strong faith (as perhaps the weakly pretty chimes of modern American churches suggest enfeebled faith). I had seen lots of unbeautiful churches and heard lots of mushy hymns and tired religious clich�s--but now I knew there was also a terrible splendour, in the spires and cathedrals and the ancient, glowing glass, in the great music of the plainsong and the masses, and in the superb language of the liturgy. To be sure such splendour didn't mean that Christianity was true; but, then, dull, horrible churches didn't mean that it wasn't. And perhaps I vaguely felt that the splendour did hint at a validity. At all events, one evening, as I walked back across the meadows into Oxford, hearing the singing of the bells and seeing the tremendous, soaring uprush of the spire of St. Mary the Virgin in the dusk, I thought (or Someone at my elbow murmured) that now, perhaps, was the time for that long-postponed second look. I did not resist. I resolved that I should plunge straightaway into the question of Christianity. I even stopped at a bookseller's then and there and came in late to tea with an armload of books. There were half a hundred books that autumn and winter. I became interested right at the start and neglected all else, though at first it was only an interesting study, not something that might turn out to be true and compel my life into other courses. By good fortune the first thing I read (because it looked easiest) was a science-fiction trilogy [Out of the Silent Planet; Perelandra; & That Hideous Strength] by an Oxford don, C. S. Lewis. This had the effect of showing me that the Christian God might, quite reasonably, be big enough, after all, to include the stars and the spiral nebulae; it wasn't proof, but for me an insuperable difficulty had, in fact, been overcome when I recognized that Christianity was not necessarily a local religion of earth. G. K. Chesterton, with wit and no pompousness, presented a brilliant, reasoned case for Christianity [The Everlasting Man, &c]. Charles Williams, theologian and novelist, opened up realms of the spirit I hadn't known existed and suggested that God's view of history might be very different to man's--and quite as possible [The Descent of the Dove; The Place of the Lion; All Hallows' Eve; Descent into Hell]. Grahame Greene showed--terribly--what sin was, and what faith was--also terrible [The Heart of the Matter; The End of the Affair; &c.] Dorothy Sayers [Creed or Chaos; The Mind of the Maker; &c.] preached the crusade, attacked complacency and dullness like a scorpion, and made Christianity dramatic and exciting. I began to see what T. S. Eliot was really saying in Ash Wednesday and The Four Quartets--and it scared me, rather. His description of the state of being Christian lingered in my mind: 'A condition of complete simplicity / (Costing not less than everything)'. Everything! Above all, there was C. S. Lewis of Magdalen College, a classicist and great authority on English literature; he had been an atheist and was now a Christian, and he could talk the language of the sceptic--my language. His was perhaps the most brilliant and certainly the most lucid mind I had ever encountered; he wrote about Christianity in a style as clear as spring water without a hint of sanctimoniousness or vagueness or double-talk--simply straightforward, telling argument laced with wit. I wrote in my Notebook at the time: 'No one who has not honestly faced up to the overwhelming question--Is Christianity possibly false?--can resolve for someone else the counter-question--Is it true? I read every book of his, particularly The Great Divorce, The Problem of Pain, Miracles, The Screwtape Letters, Pilgrim's Regress, and (later) Suprised by Joy. I also read a number of the Christian classics, including St. Augustine, The Imitation of Christ, The Flight from God, Apologia Pro Vita Sua, and the Practice of the Presence. And--of course--the New Testament in numerous translations along with several Catholic and Protestant commentaries. I approached the Testament with reluctance--a legacy of boredom--even though I knew it related what was in fact earth's chief historical event, but the reluctance vanished as all came together into meaning. The best argument for Christianity is Christians: their joy, their certainty, their completeness. But the strongest argument against Christianity is also Christians--when they are sombre and joyless, when they are self-righteous and smug in complacent consecration, when they are narrow and repressive, then Christianity dies a thousand deaths. But, though it is just to condemn some Christians for these things, perhaps, after all, it is not just, though every easy, to condemn Christianity itself for them. Indeed, there are impressive indications that the positive quality of joy is in Christianity--and possibly nowhere else. If that were certain, it would be proof of a very high order. Besides the books and the Christian friends, I had another tremendous advantage: I did not suppose I was a Christian. I was quite outside the fold, and did not think for a moment that I was in it. Thus I was perfectly aware that the central claim of Christianity was and always had been that the same God who had made the world had lived in the world and been killed by the world, and that the (claimed) proof of this was His Resurrection from the dead. This, in fact, was precisely what I couldn't believe. But, at least, I knew that it was what had to be believed if one was to call oneself a Christian; so I did not call myself one. But in later years I have met people who no more believe in this central claim than they believe in the Easter bunny, yet they call themselves Christians all the same, on the basis, apparently, of going to church and being nice: I submit that these people prove that there can be smoke without fire. At all events, I , being outside Christianity, was not too close to see it--thus it is that my conversion could be said to have begun when I abandoned Christianity and started to put as much distance as possible between it and me. Now I was not so close that I mistook the foothills for the mountain. I saw it there only too clearly, solitary, vast, ice-capped, and apparently unscaleable by me: I knew I had to believe. Christianity was a faith. I write on an impulse--which in the morning may appear so immodest and presumptuous that I shall destroy this. But a few moments ago I felt that I was embarked for a voyage that would someday lead me to God. Even now, five minutes later, I'm inclined to add a qualifying 'maybe.' There is a leap I cannot make; it occurs to me that you, having made it, having linked certainty with Christianity, might, not do it for me, but might give me a hint of how it's to be done. Having felt the aesthetic and historic appeal of Christianity, having begun to study it, I have come to awareness of the strength and 'possibleness' of the Christian answer. I should like to believe it. I want to know God--if he is knowable. But I cannot pray with any conviction that Someone hears. I can't believe. Very simply, it seems to me that some intelligent power made this universe and that all men must know it, axiomatically, and must feel awe at the power's infiniteness. It seems to me natural that men, knowing and feeling so, should attempt to elaborate on that simplicity--the prophets, the Prince Buddha, the Lord Jesus, Mohammed, the Brahmins--and so arose the world's religions. But how can just one of them be singled out as true? To an intelligent visitor from Mars, would not Christianity appear to be merely one of a host of religions? And yet I would like to believe that the Lord Jesus is in truth my merciful God. For the apostles who could talk to Jesus, it must have been easy. But I live in a 'real world' of red buses and nylon stockings and atomic bombs; I have only the record of others' claimed experiences with deity. No angels, no voices, nothing. Or, yes, one thing: living Christians. Somehow you, in this very same world, with the same data as I, are more meaningful to me than the bishops of the faithful past. You accomplished the leap from agnosticism to faith: how? I don't quite know how I dare write this to you, a busy Oxford don, not a priest. Yet I do know: you serve God, not yourself; you must do, if you're a Christian. Perhaps, if I had the wit to see it, my answer lies in the fact that I did write. My own position at the threshold of Xtianity was exactly the opposite of yours. You wish it were true: I strongly hoped it was not. At least, that was my conscious wish: you may suspect that I had unconscious wishes of quite a different sort and that it was these which finally shoved me in. True: but then I may equally suspect that under your conscious wish that it were true, there lurks a strong unconscious wish that it were not. What this works out to is that all that modern stuff about concealed wishes and wishful thinking, however useful it may be for explaining the origin af an error which you already know to be an error, is perfectly useless in deciding which of two beliefs is the error and which is the truth. For (a.) One never knows all one's wishes, and (b.) In very big questions, such as this, even one's conscious wishes are nearly always engaged on both sides. What I think you can say with certainty is this: the notion that everyone would like Xtianity to be true, and that therefore all atheists are brave men who have accepted the defeat of all their deepest desires, is simply impudent nonsense. Do you think people like Stalin, Hitler, Haldane, Stapledon (a corking good writer, by the way) wd. be pleased on waking up one morning to find that they were not their own masters, that they had a Master and a Judge, that there was nothing ever in the deepest recesses of their thoughts about which they cd. say to Him 'Keep out. Private. This is my business'? Do you? Rats! Their first reaction wd. be (as mine was) rage and terror. And I v. much doubt whether even you wd. find it simply pleasant. Isn't the truth this: that it wd. gratify some of our desires (ones we feel in fact pretty seldom) and outrage a great many others? So let's wash out all the Wish business. It never helped anyone to solve any problem yet. I don't agree with your picture of the history of religion -- Christ, Buddha, Mohammed and others elaborating an original simplicity. I believe Buddhism to be a simplification of Hinduism and Islam to be a simplification of Xtianity. Clear, lucid, transparent, simple religion (Tao plus a shadowy, ethical god in the background) is a late development, usually arising among highly educated people in great cities. What you really start with is ritual, myth, and mystery, the death & return of Balder or Osiris, the dances, the initiations, the sacrifices, the divine kings. Over against that are the Philosophers, Aristotle or Confucius, hardly religious at all. The only two systems in which the mysteries and the philosophies come together are Hinduism & Xtianity: there you get both Metaphysics and Cult (continuous with the primeval cults). That is why my first step was to be sure that one or other of these had the answer. For the reality can't be one that appeals either only to savages or only to high brows. Real things aren't like that (e.g. matter is the first most obvious thing you meet -- milk, chocolates, apples, and also the object of quantum physics). There is no question of just a crowd of disconnected religions. The choice is between (a.) The materialist world picture: wh. I can't believe. (b.) The real archaic primitive religions: wh. are not moral enough (c.) The (claimed) fulfilment of these in Hinduism. (d.) The claimed fulfilment of these in Xtianity. But the weakness of Hinduism is that it doesn't really join the two strands. Unredeemably savage religion goes on in the village: the Hermit philosophies in the forest: and neither really interferes with the other. It is only Xtianity wh. compels a high brow like me to partake in a ritual blood feast, and also compels a central African convert to attempt an enlightened universal code of ethics. . . .
Have you read the Analects of Confucius ? He ends up by saying 'This is the Tao. I do not know if any one has ever kept it.' That's significant: one can really go direct from there to the Epistle to the Romans. . . .
My fundamental dilemma is this: I can't believe in Christ unless I have faith, but I can't have faith unless I believe in Christ. This is 'the leap.' If to be a Christian is to have faith (and clearly it is), I can put it thus: I must accept Christ to become a Christian, but I must be a Christian to accept Him. I don't have faith and I don't as yet believe; but everyone seems to say: 'You must have faith to believe.' Where do I get it? Or will you tell me something different? Is there a proof? Can Reason carry one over the gulf . . . without faith? Why does God expect so much of us? Why does he require this effort to believe? If He made it clear that He is--as clear as a sunrise or a rock or a baby's cry--wouldn't we be right joyous to choose Him and His Law? Why should the right exercise of our free will contain this fear of intellectual dishonesty? I must write further on the subject of 'wishing it were true'--although I do agree that I probably have wishes on both sides, and my wish does not help me to solve any problem. Your point that Hitler and Stalin (and I) would be horrified at discovering a Master from whom nothing could be withheld is very strong. Indeed, there is nothing in Christianity which is so repugnant to me as humility--the bent knee. If I knew beyond hope or despair that Christianity were true, my fight for ever after would have to be against the pride of 'the spine may break but it never bends'. And yet, Sir, would not I (and even Stalin) accept the humbling of the Master to escape the horror of ceasing to be, of nothingness at death? Moreover, the knowledge that Jesus was in truth Lord would not be merely pleasant news gratifying some of our rare desires. It would mean overwhelmingly: (a) that Materialism was Error as well as ugliness; (b) that the several beastly futures predicted by the Marxists, the Freudians, and the Sociologist manipulators would not be real (even if they came about); (c) that one's growth towards wisdom--soul-building--was not to be lost; and (d), above all, that the good and the beautiful would survive. And so I wish it were true and would accept any humbling, I think, for it to be true. The bad part of wishing it were true is that any impulse I feel towards belief is regarded with suspicion as stemming from the wish; the good part is that the wish leads on. And I shall go on; I must go on, as far as I can go. The contradiction `we must have faith to believe and must believe to have faith' belongs to the same class as those by which the Eleatic philosophers proved that all motion was impossible. And there are many others. You can't swim unless you can support yourself in water & you can't support yourself in water unless you can swim. Or again, in an act of volition (e.g. getting up in the morning) is the very beginning of the act itself voluntary or involuntary? If voluntary then you must have willed it, you were willing it already, it was not really the beginning. If involuntary, then the continuation of the act (being determined by the first movement) is involuntary too. But in spite of this we do swim, & we do get out of bed. I do not think there is a demonstrative proof (like Euclid) of Christianity, nor of the existence of matter, nor of the good will & honesty of my best & oldest friends. I think all three (except perhaps the second) far more probable than the alternatives. . . . As to why God doesn't make it demonstrably clear; are we sure that He is even interested in the kind of Theism which wd. be a compelled logical assent to a conclusive argument? Are we interested in it in personal matters? I demand from my friend a trust in my good faith which is certain without demonstrative proof. It wouldn't be confidence at all if he waited for rigorous proof. Hang it all, the very fairy tales embody the truth. Othello believed in Desdemona's innocence when it was proved: but that was too late. `His praise is lost who stays till all commend.' The magnanimity, the generosity which will trust on a reasonable probability, is required of us. But supposing one believed and was wrong after all? Why, then you wd. have paid the universe a compliment it doesn't deserve. Your error wd. even so be more interesting & important than the reality. And yet how cd. that be? How cd. an idiotic universe have produced creatures whose mere dreams are so much stronger, better, subtler than itself? . . . It is quite clear from what you say that you have conscious wishes on both sides. And now, another point about wishes. A wish may lead to false beliefs, granted. But what does the existence of the wish suggest? At one time I was much impressed by Arnold's line `Nor does the being hungry prove that we have bread.' But surely tho' it doesn't prove that one particular man will get food, it does prove that there is such a thing as food! i.e. if we were a species that didn't normally eat, weren't designed to eat, wd. we feel hungry? You say the materialist universe is `ugly.' I wonder how you discovered that! If you are really a product of a materialistic universe, how is it you don't feel at homne there? Do fish complain of the sea for being wet? Or if they did, would that fact itself not strongly suggest that they had not always, or wd. not always be, purely aquatic creatures? Notice how we are perpetually surprised at Time. (`How time flies! Fancy John being grown-up and married! I can hardly believe it!') In heaven's name, why? Unless, indeed, there is something about us that is not temporal. . . .
My position at this point--on the brink--was something like this: I had taken the 'second look' at Christianity so long before resolved on; and I had found--what had I found? Much more than I had expected, certainly. Christianity now appeared intellectually stimulating, aesthetically exciting, and emotionally moving. I was half in love with Jesus; I yearned towards him and wanted to fall on my knees. Like the woman in Graham Greene who fell into belief as one falls in love, I was falling in love, but my mind was suspicious: Something kept saying, 'Don't be overcome! Keep your head! However delicious and comforting it would be, don't give in!' No longer did the Church appear only a disreputable congeries of quarrelling sects: now I saw the Church splendid and terrible, sweeping down the centuries with anthems and shining crosses and steady-eyed saints. No longer was the Faith something for children; intelligent people held it strongly--and they walked to a secret singing that I could not hear. Or did I hear something, high and clear and unbearably sweet? One dear person who had been with me outside the Faith suddenly, in the course of walking across a room, was snatched away, into that singing, into the Comapny of the Faithful. I was alone, and I felt, sulkily, that I had been betrayed. If I couldn't advance, no one else ought to. Christianity seemed to me probable: it all hinged on Jesus--Was he, in fact, the Lord Christ? Was he 'very God of very God'? This was the heart of the matter. The claimed proof was the Resurrection; it was belief in Christ's rising from the dead, I knew well enough, that had convinced the early Christians. And I saw clearly that there were really only three possibilities: the Apostles had made up the story after the crucifixion; or Jesus himself had invented the claim to divinity and they had dreamt the rest; or--it was precisely and factually true. I had got over the naive belief that modern science had somehow demonstrated that miracles can't happen or that science, which is concerned with nature, could say anything at all about the possible intervention of Supernature. Therefore, the Incarnation and the Resurrection might be true. It was simply a question of evidence, nor did the fact that I had never seen a miracle imply that there might not be miracles at the supreme occasion of history. It seemed extremely unlikely that the Apostles had concocted the story: the Gospels ring with sincerity, and, besides, men don't die proclaiming with their last breaths what they know to be a lie especially when they might save their lives by recanting. Most of these men had been unpleasantly executed, and, had they recanted, the recantation would have been famous. But, equally, I could not accept that Jesus himself had been deluded: A man who goes about forgiving sins, claiming to have existed through all eternity [Before Abraham was, I am], saying that whoever had seen him (notice, he did not modestly suggest divinity in everyone by saying that whoever had seen old Peter there) had seen the Father--such a man is not merely deluded, he is deranged, a rather horrible megalomaniac; or He is speaking the truth. And I could not believe that a lunatic could have spoken the Sermon on the Mount or the parables. So I was faced with the third alternative. It was not impossible; it alone was possible; but it was too enormous to be comprehended. I knew it was a reasonable probability; I suspected it to be true. I suspect that all the yearnings for I knew not what that I had ever felt--when autumn fires were burning in the twilight, when wild geese flew crying in the night, when spring arrived on an April morning--were in truth yearnings for God. But suspicion is not certainty. There was still the gap between the probable and the proved; and, if I were to stake my whole life on the Risen Christ, I wanted certainty; I wanted proof; I wanted letters of fire across the sky. I did not get them. And I waited. One night while reading, deeply moved, Dorothy Sayers' tremendous play, The Man Born to be King, I was struck by the significance of the reply to Jesus's query about faith: 'Lord, I believe; help thou mine unbelief.' A contradiction, a paradox. But could it be the key to that other paradox: 'One must have faith to believe but must believe to have faith'? A paradox to open up a paradox? I felt that it was; and I also felt that this was a significant 'break through'. I choose to believe in the Father, Son, and Holy Ghost--in Christ, my lord and my God. Christianity has the ring, the feel of unique truth. Of essential truth. By it, life is made full instead of empty, meaningful instead of meaningless. Cosmos becomes beautiful at the Centre, instead of chillingly ugly beneath the lovely pathos of spring. But the emptiness, the meaninglessness, and the ugliness can only be seen, I think, when one has glimpsed the fullness, the meaning, and the beauty. It is when heaven and hell have both been glimpsed that going back is impossible. But to go on seemed impossible, also. A glimpse is not a vision. A choice was necessary: and there is no certainty. One can only choose a side. So I--I now choose my side: I choose beauty; I choose what I love. But choosing to believe is believing. It's all I can do: choose. I confess my doubts and ask my Lord Christ to enter my life. I do not know God is, I do but say: Be it unto me according to Thy will. I do not affirm that I am without doubt, I do but ask for help, having chosen, to overcome it. I do but say: Lord, I believe--help Thou mine unbelief. Two roads seemed to diverge from this point, as I saw it from the one I had chosen. One was rather dark and very smooth, broad and ever broadening until it debouched in a dark desert and ceased to be a road. The other was brilliantly lighted, almost too light for comfort, I felt, though light was needed, for the road was rough and horribly steep and ever narrowing. This, the lighted road, was the one I had chosen, though I was only at the beginning: the obstacles and the wearying steepness and the dangerous narrowness, all lay ahead. Still, I could see where I was going, and that seemed to me to be the great thing. My prayers are answered. No: a glimpse is not a vision. But to a man on a mountain road by night, a glimpse of the next three feet of road may matter more than a vision of the horizon. And there must perhaps be always just enough lack of demonstrative certainty to make free choice possible: for what could we do but accept if the faith were like the multiplication table? There will be a counter attack on you, you know, so don't be too alarmed when it comes. The enemy will not see you vanish into God's company without an effort to reclaim you. Be busy learning to pray . . . Blessings on you and a hundred thousand welcomes. Make use of me in any way you please: and let us pray for each other always. Forty days after: The decision made, one begins to act on it. One prays, goes to church, makes an incredibly meaningful first Christian communion. One tries to rethink everything one has ever thought in this new Light. One tries to subordinate self--to make the Sign of the Cross, crossing out the 'I'--and to follow Christ, with something less than brilliant success. C. S. Lewis prophesies the enemy's counterattack, and is right as usual. Feelings surge in that it's lies, all lies, that yonder red bus, the hard pavement under one's heels, the glory of the may tree are the only realities. But one remembers that the Choice was based on reason, the weight of the evidence, and is strengthened. But that's not quite all. Not only can the doubts be coped with, not only do prayers go better, but the doubts come less often--and when they do are often met with a surge of inexplicable confidence that the Choice was right. We are winning. By the grace of God, I was surrounded by strong Christian friends, including Lewis who became a good friend. Moreover, the Anglican church of St. Ebbe's was a church that was filled with the Holy Spirit. I tended to take this for granted at the time, but, as a result, I could never take for granted any church less full of the Spirit. At all events, I was strengthened and supported by the sure and lively faith of that church. It was divided up, informally, into little Christian cells; my friends from the University and I were one such cell, which included other Christians, such as the Benedictine monk, as well. For two years there was hardly an evening that some of this group were not together, early or late, reading Christian poetry, studying the Bible, and, above all, talking--holding lively discussions far into the night on every aspect of the Faith and the Faith in relation to everything else. Non-Christians came, too, and some of them became Christians. The time came at last when, one by one, we were going down from the University--to London and Devonshire, to Africa and Canada, to Indiana and Virginia. I remembered Lynchburg as a city of churches--not such venerable and beautiful churches, perhaps, but it was the Holy Spirit that was important. And where there were churches, there would be, naturally, the Holy Spirit and a strong, Christ-centered life. There would be constant, lively searching into the meaning of Life in Christ. To be sure, I had not, in fact, noticed this vivid Christian life, doubtless surging all about me, when I had been in Lynchburg--but, then I hadn't been a Christian. Now all would be different. It wasn't quite as I expected in Lynchburg on the James. There were the churches, true; and everyone attended, but where was the surging Christian life? My parish church, and every church I visited, seemed almost dead to Christ. No doubt there were Christians, but I did not find them. Most of those I talked to seemed mainly interested in the success of the convivial Couples' Club or in the radical racial ideas of the Bishop or in money and membership--but no one talked of Christ. One felt it would be rather bad form to speak of Him or to suggest that the Church, possibly, ought to be more than a social club and symbol of respectability. No doubt Christ was there, somewhere, but so, too, was the world. Even more dismaying, in other circles, was the watering-down of the Faith to little more than respect for (some of) Jesus' moral precepts. 'Yes,' said these unbelievers who called themselves Christians, 'yes, Jesus was the divine Son of God; so are we all divine Sons of God. Of course there was an incarnation; each of us is the incarnation of God. If St. John suggests anything else, or St. Paul does, they are not to be depended on. Miracles--well, no, we happen to know God doesn't work that way. There was no Resurrection, except in some very, very spiritual sense, whatever those naive Apostles thought. Of course we're Christians--though no doubt Buddhism and Islam and all religions except the Catholic Church are equally worthwhile. Truth?--what is truth? What has truth got to do with it? A Christian is one who follows the more reasonable bits of the Sermon on the Mount, someone who is good. A Christian is a seeker who must never find, lest he cease to be a seeker.' All this, to one who held the ancient Christian faith, was depressing and dismaying. It was about as far from the strong red wine of the Faith as cold tea. The Faith, like 'alcohol', (the local name for the divine and lovely wine of Cana), was too strong: the wine must be turned to grape juice in an anti-miracle and the Faith deincarnated. What was left had nothing in common with the Christ I had encountered except a set of words--and they had different meanings. In other ages people who could not believe in Christianity (and, admittedly, it takes some believing) had called themselves Deists or Unitarians, not Christians; but these people, for reasons I could not understand, were intent to reduce the Faith to a mild morality that they, and indeed anyone except a villain, might accept and to call this milk-and-water religion the Christian Faith. It was at this point that there came into my mind a casual remark at Oxford long ago, when a friend returning from a Long Vacation in Italy remarked with a smile: 'All the Italian country priests believe quite firmly that Protestantism is dying. "Look," they say, "look at the rise of materialism and the weakening of faith in England and America; they care for nothing except getting rich. All their religion is dying. It's the withering of the branch cut off from the True Vine. In another century or two it will be gone--and what is a century or two to The Church?"' We had laughed and wished those Italian priests might see St. Ebbe's. But now, somehow, I didn't feel much like laughing. I began to think seriously of the mother church and to ask myself the question that every Christian must sometime ask: Is that enormous church, so full of faith and learning, so full of variety except in the strong, unchanging faith, is it, after all, THE Church? The True Vine? The question, essentially, seems to be: What is the Church? Is the Roman Catholic Church itself, including the faithful who are outside, the Church? Or is it the 'invisible church'--the blessed company of all the faithful? Or is there a third answer? I do not know, I still do not know, though I have studied and talked with priests and nuns and ministers. It is not the purpose of this paper to explore the question; but I acknowledge that, once the earlier question--is Christ God?--has been answered in the affirmative, one must face up to the further question posed by the existence in history and the undeviating assertion of the Catholic Church. Meanwhile, I was gradually discovering a few Christians and was heartened. A girl came to my house to argue about a chance remark of mine about Christianity; she came again with a friend; and, before long, there was a group discussing Christianity: some of them were or became Christians; and there, sometimes, was a fragment of the Church--two or three gathered together in His name. My parish church, though wanting the vigour of Christian life, was at least a place of beauty, enriched despite itself by the unchanging strength and significance of the liturgy--and at its altar one received the blessed sacrament. This I felt to be essential: the Holy Eucharist celebrated by a priest ordained by an Apostolic bishop--the unbroken chain of the laying on of hands from the Twelve, so like and yet so different to that other unbroken chain of the faithful through which I had received the Faith. I do not say that other communion services may not be means of grace to their communicants: God can limit me, but I cannot, assuredly, limit Him. At all events, I clung to the Sacrament. So the years passed: the student group, prayer, the sacraments. Then one Sunday afternoon my daughter-in-Christ--another link in that never-ending chain, from her to me to C. S. Lewis to George MacDonald and back, untraceably, to Christ Himself--took me to lunch at the Lodge of the Fishermen--a coffee house operated by the Christian community of the small, ecumenical Church of the Covenant--and we stayed for the afternoon as well. An afternoon of lively talk about Life in Christ. People who were supremely interested in Christ. People who walked to that secret singing. The Holy Spirit hovering in the room 'with warm breast and with, ah! bright wings'. It was like coming home.